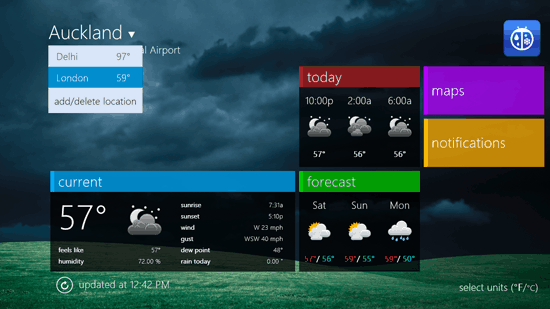 WeatherBug is a free weather app for Windows 8 and 8.1. With a minimalist layout, this weather app works perfectly to give you a detailed view of the weather of your city or of anywhere around the world. When WeatherBug starts, it asks you to allow to access your location so that it can show you the weather report correctly of your location. You can click on Allow button to let the weather app have complete access to the location you are in. You can add up to five locations to this weather app to view weather conditions of different places together. You can search for the places to be added in the location list by the city, zip code or address. After searching for the location you can click on “add location” button at the bottom to add it to the list of locations you want to be displayed on the weather condition deck. To view a detailed weather report of a particular location, you simply have to click on the large tile of that location from the weather deck. A new screen will be opened in the app where you can see the different tiles showing various details about the current weather of the city. On top left side of the screen, you will see the name of the city, there will be a large tile stating the current temperature, humidity rate, wind, dew point, rain, etc. In the tile of today, you will see the transitions in the weather temperature for the present day depending on different timing of the day. 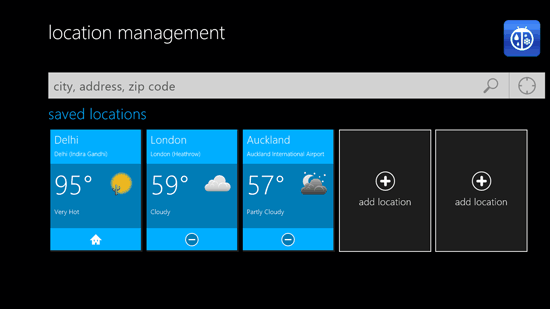 The forecast tile shows future weather temperatures. From the detailed weather condition screen, you can change the location by clicking on the tiny down arrow beside the city name. There are no menu options in the app.